My buddy Joe Hargis tipped me off to this story. The Carleton College student web magazine (SHOUT), is featuring some photos of one of my favorite subjects through the lens of one the downtown-loving students, Ana Lagunez (class of ’08). There are some really cool shots of some familiar sights. 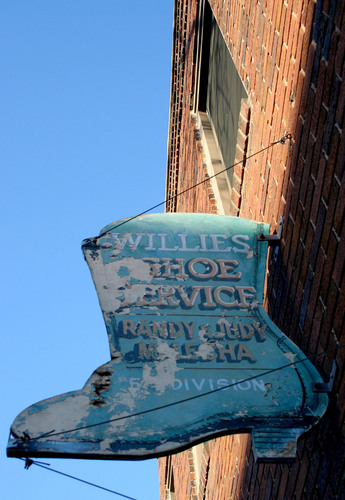 The shot to the left is the “former” sign on Willie’s Shoe Service. Thanks to Joe for the hot tip and Ana for the fun photos. This downtown photo gallery is fantastic. Thanks to Joe for the tip and to Ana for the great perspective on the downtown district. Maybe this could inspire a photography contest to help promote downtown. Some of Ana’s shots beg for answers to the “where is this picture?” strategy of another famous Northfield blogger.